What is the R Cert? The R Cert is a consumer-facing standard for recycled textile clothing that guarantees that brands recycled their own ‘factory fresh’ textile waste into their own recycled textile clothing. This enhances closed loop recycling. The R Cert ensures that brands recycled a minimum of 20% recycled fibres in a traceable supply chain. These three unique sustainability pieces, textile recycling, environmental savings and transparency, unite to give consumers a more complete sustainable fashion picture. The R Cert is issued by Redress, the non-profit NGO with a mission to promote environmental sustainability in the fashion industry by reducing textile waste, pollution, water and energy consumption. If you would like to know more about the R-Cert or if you are a brand interested in getting certified, please download more information here or contact us. Redress works with brands seeking the R Cert to establish their supply chains and to identify their sources of textile waste. Redress then independently checks the brand’s supply chain with a series of self-declaration forms and documentation to confirm the brand’s chain of custody of the textile waste and recycled textile garments. Redress encourages brands to use factories that have a Global Recycle Standard certificate. GRS is a factory level standard for recycled materials that ensures that factories have a track and trace system in place and that they comply with selected environmental and social criteria. The brand can recycle any of their ‘factory fresh’ textile waste, including their cut-and-sew waste, end-of-rolls or their unsold clothing waste, which is often referred to as pre-consumer textile waste. The brand’s suppliers or factories collects the textile waste and sorts it by colour and type. Redress then checks multiple supporting documentation about the textile waste and Redress may perform a site visit to assess the textile waste. The brand’s textile waste is then regenerated and spun into recycled yarn. The brand’s textile waste is recycled. First, it is shredded into smaller fibres and then it may be blended with virgin fibres. The R Cert requires that a minimum of 20% recycled fibres remains in the blend and in the finished garment. The recycled yarn is then woven or knitted into a new, recycled textile. The recycled textile is then cut and sewn into new recycled textile clothing. All documentation is checked. 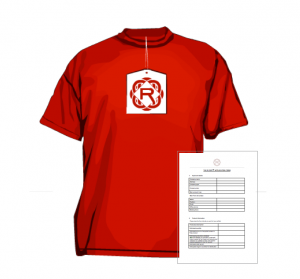 Subject to meeting the R Cert requirements, the brand is issued the R Cert. The R Cert clothing’s hangtag contains information that directs the consumer to the R Cert website, via a direct QR code, which consumers can scan with mobile devices, or a TRACK code on the hangtag. When on the website, consumers can access easy-to-understand information about their recycled textile clothing and their brand’s supply chain.